The Wedding Season has begun....Women need to wear different dresses for the various occasions like Mehndi, Sangeet etc. Everyone wants to look their best. 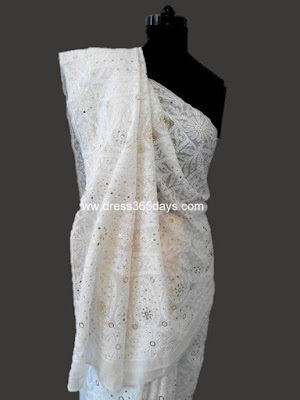 So why wait...Grab a pure georgette Chikankari Saree with Golden Mukaish/ Kamdani Work. These are available in various patterns like full jaal all over saree or border pall saree. Full Jaal work sarees are very exclusive and heavy party wear sarees. If one is looking for a lighter saree they can opt for a border pallu saree wherein the body has chikankari border and pallu is fully worked. 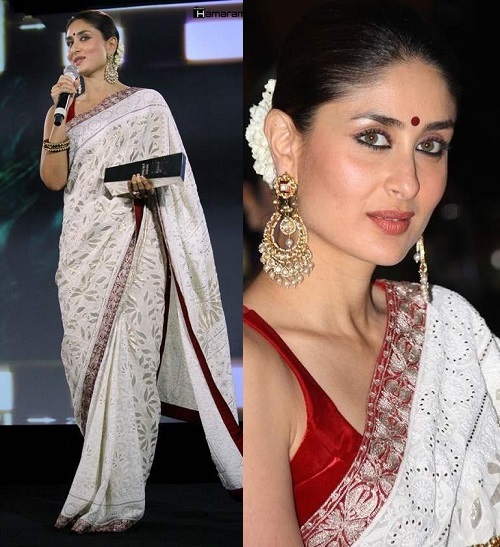 In another variant of pure georgette saree chikankari saree the work will be till knees and pallu would be heavy. These are called skirt jaal sarees. Pure georgette sarees can be easily dyed in any colour. They look best when dyed in pastel shades like peach, Beige and lemon yellow. One can also use another fabric for blouse to give a different look to the saree.